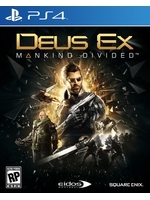 After the PC videos, the PS4 version of Deus Ex: Mankind Divided is now on Gamersyde. 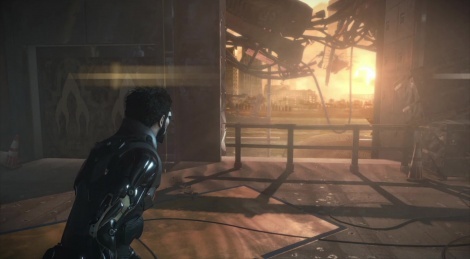 6 videos to meet Adam Jensen at the beginning of his adventure. Xbox One videos will be available very soon. Couldn't help but compare this to Killzone Shadowfall, which I think still looks better than this game visually. Plus weird onconsistencies like the email from the one dude looked like a photograph of a real person, then the next dude looked like a poor 3d model from 2005. Weird. its surprisingly nice looking. and at least manages to maintain visuals on-par with the norm of the generation. (it even has screen space reflections on polished surfaces and wet streets) unlike the previous game which frankly looked like it started development on a PS2 and was buffed up a bit for PS3. lip syncing is still off, but graphically its nice, and artistically it's top tier. I ask this question a lot but is there an option to disable the highlighted objects? Yes. All the HUD is tweakable too. This game visually looks last gen. There's also some awkward physics. The PC footage looked nice, but still not impressive. do not kid yourself, the amount of content rendered is much more than the last gen. the last generation did not use tressFX period. I have to agree that the visuals aren't the best and are pretty far away from the first screenshots. It's mainly the flat lighting and textures that aren't sharp. But a huge step up from DE: HR. Great screenshots, must be a joy to play at 10 fps. Who's the peasant now? Also of important note is the fact that even Driftwood's beast of a PC with a GTX 1080 is having trouble running the game at 1080p@60fps with Ultra settings + MSAA 2-4x, what kinda of performance do you expect to have at with Ultra settings at 4K + MSAA 8x? Those are not representative of the game at 1080p on PC - specially not for 99,99% of PC gamers. Sure it can look as beautiful as that, but I really doubt even a Sli of GTX Titan X (new version) would hit 4K@60fps + MSAA 8x with Ultra settings in this game. Even The Witcher 3: Wild Hunt doesn't run at 4K@60fps with all settings maxed, and it's a well optimized game that runs on a wide range of GPUs. Hell, even Battlefield 4 at 4K@60fps needs some settings dialed down to not dip below 60fps, and that's one of the most optimized games on the market. C'mon... you're really grasping at straws now thinking the game "looks fine" on PC by using those images as some sort of proof. I'm pretty sure the devs didn't hit more than 15fps either when they took and released those, but yea... if you want to believe every PR material that is shown to you, you will eventually end up disappointed when the game hits the shelves. Tbh with you, I think the game looks great on any system (not into pixel counting), i just never expected bullshot quality. If you want to boycott singleplayer microtransactions don't buy this game. Wait what? What micro-transactions? Did they add something in the retail version? The day one patch added a "shop" entry in the main menu where you can buy praxis kits and credits with real money. This way, the early reviews omit it. Granted it's not in the "in game" menus but it's one step closer. You can already see people saying you don't have to buy them but shoving a store in a singleplayer game is gross. Edit: Store for DLC is okay but this really is gross. As long as they find people to buy, they'll keep doing it.